Over the last 200 years crochet in its various forms has given rise to an unknown number of stitches. Crochet Techniques brings together instructions for stitches and their variations to create five colourful and attractive samplers - two based on Classic stitches, one on Jacquard stitch, a fourth based on Tunisian crochet (also called Tricot), and another based on Crochenit (sometimes known as 'on the double' crochet. Working these patterns will help you gain a solid, well-grounded knowledge of crochet. Many of the stitches are a breeze, and others require a little more concentration - but there's no equal to the feeling of accomplishment that mastering them will give you. As you make your way through the techniques you will discover a range of interesting and useful stitches that you will want to use over and over again - not just as rugs but to create items of your own. You will also find discussion of common crochet problems and tips for solving them. Look out for this informative and comprehensive book. It is a valuable reference for any lover of crochet with a wide selection of stitch patterns and techniques. There are 36 linear stitch patterns and 19 in-the-round motifs that can be used for many different projects and ideas. The book presents them as morsels that can then be combined to create rugs and throws as a decorative reference that can inspire you again and again. The book then progresses to colour work where 30 squares are charted as cololurful patterns that can all be extended and worked in any shade you like. 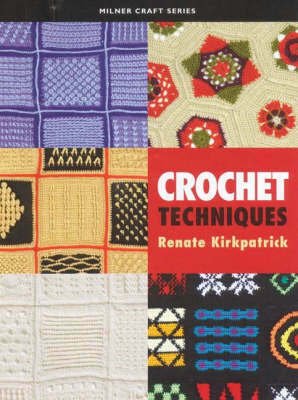 Carrying on further than many other crochet books, Renate then shows how to work another 36 patterns in Tunisian crochet and 30 ways with crochenit, a derivative of Tunisian crochet. As well as being an extensive collection of patterns for an avid crocheter, the book is also an excellent primer for anyone who is new to crochet. The basics of the technique are thoroughly and clearly explained in down to earth language and excellent diagrams and is an excellent source.